Something Rotten! continuing its national tour by stopping by the Hippodrome for an all-too-brief run, delivers countless “you’re killing me” moments from end to end. That is, if you find the likes of puritanical oppression and the black plague humorous. Comedic moments are highlighted by well-placed double entendres and a not-too-subtle stream of gaiety, or should I say gayness, running through the production. The Tony Award winning production irreverently takes on other Broadway musicals like no other, even more so than The Producers, The Book of Mormon, and Shrek to name a few. In fact, there are no less than forty references to Broadway musicals in Something Rotten! 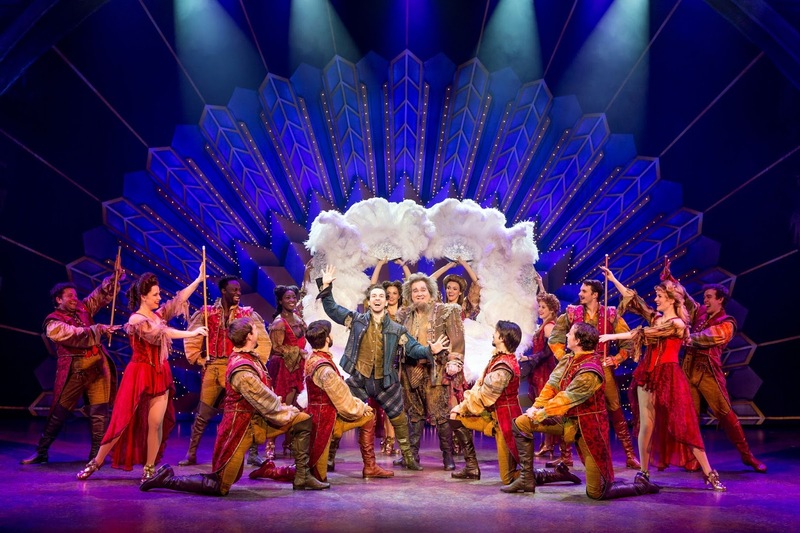 Magnificently directed and choreographed by Tony Award winner Casey Nicholaw, Something Rotten! features music and lyrics by Wayne Kirkpatrick and Karey Kirkpatrick and a book by Karey Kirkpatrick and John O’Farrell. 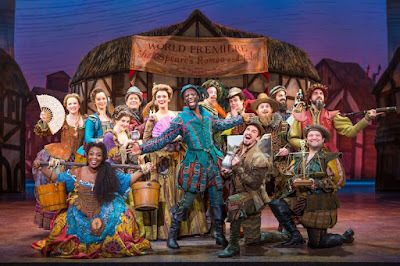 Contributing to the show’s excellence are the stellar sets designed by Scott Pack, the brilliant period costuming including exaggerated codpieces worn by the men and even omelet costumes (where else would you see those?) designed by Gregg Barnes, the hue-rich lighting design by Jeff Croiter, the effective sound design by Peter Hylenski, and the fine orchestra conducted by Brian P. Kennedy. Its music is catchy for sure but the lyrics are stunningly clever. Most successful Broadway musicals have a show-stopping number that is elicits ovations from audiences. Something Rotten! boasts two such epochal moments. The elaborate number “A Musical” is performed halfway through the first act. Its high-energy tap dancing and kick line choreography and fabulous lyrics, which include clever references to a bevy of Broadway musicals, such as Rent, South Pacific, and A Chorus Line, drew a thunderous extended ovation on opening night. Also bringing down the house was the second act “Make an Omelette” that contains similar ingredients. 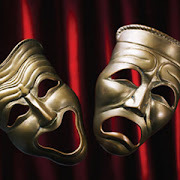 Moreover, a solid musical may present one or two scene-stealers during the course of the show. Something Rotten! delivers a multitude, which accounts for the prodigious amount of laughter-producing lines. Finding a soothsayer, Thomas Nostradamus (Daniel Beeman), the nephew of THE Nostradamus, Nick is told that the wave of the future is a musical, whereby the actors break out into song and dance in the middle of their dialogue. What a concept! Nostradamus, who apparently did not have all his wires connected properly, looked into the future and predicted the next great play would be “Omelette,” instead of Shakespeare’s greatest hit that sounds similar. Mr. Beeman is rip-roaring funny in this sequence and is one of the show’s scene stealers. Shakespeare, meanwhile, displaying surprising insecurity, is worried that the Bottom Brothers are stealing his work. The ensuing madness, dominated by eggs, needless to say, comprises the rest of the plot. Adam Pascal does well as the conceited, gloating, swaggering, Billy Idol-like Shakespeare fresh off his hit play “Romeo and Juliet.” He is the rock star of his time; men and women alike adore him, except, of course, Nick Bottom. He delivers the numbers “Will Power” and “Hard to Be the Bard” with gusto. 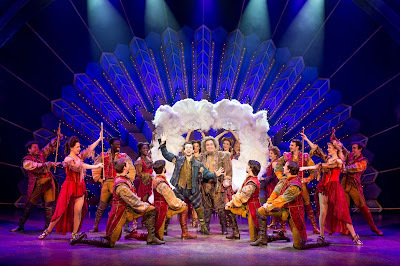 As Nigel, Josh Grisetti, looks up to Shakespeare though he tries to work with his brother on producing the musical. However, his love interest, a Puritan named Portia (Autumn Hurlbert), convinces Nigel, a poet, that he should write from his heart. Somehow, co-writing “Omelette” doesn’t feel right to him. As the strict father of Portia, Brother Jeremiah (Scott Cote) seems to be the father of all Puritans. Bible clinging, intolerant, set in his beliefs, Brother Jeremiah has a habit of slip-of-the-tongue oops moments revealing that perhaps he’s hiding something. If so, he’s not hiding it too well. Mr. Cote deliciously plays this role to the hilt. Another deft performance is turned in by Jeff Brooks as Shylock, the Jewish moneylender, who cannot legally invest in the musical. Dropping Yiddish words during the dialogue, Mr. Brooks is such a mensch. Nick Rashad Burroughs as the Minstrel who opens up each act with “Welcome to the Renaissance” does a fine job in setting the tone for the show. The remainder of the cast provides superb support for the leads with their energetic, precise dancing and strong vocals. Something Rotten! is a gorgeous spectacle in every respect. The wonderful music, hilarious lyrics, zany story, well-placed satire and an amazingly talented cast and crew make this a must-see show. As the tour advances around the country, I wish all the performers well and to break an egg. Advisory: This show contains sexual innuendo and may not be suitable for children. Something Rotten! Plays through April 23 at the Hippodrome Theatre at the France-Merrick Performing Arts Center, 12 N. Eutaw St, Baltimore, MD 21201. For tickets, call Ticketmaster at 800-982-ARTS or visit ticketmaster.com or BaltimoreHippodrome.com. Labels: Hippodrome Theatre, Something Rotten! British author Terry Pratchett once wrote, “It’s still magic even if you know how it’s done.” In The Magic Play that is currently inhabiting the Mainstage at the Olney Theatre Center in a rolling world premiere, the audience is kept in the dark as to how each trick is accomplished; the results are what matter in what is perceived as magic. In reality, illusion is not magic. Card tricks are not magic. Sleight-of-hand is not magic. They just seem that way, especially if we don’t know how the tricks are executed. And to be sure, everybody wants to know! More importantly, relationships can’t be forged through magic, whether they are romantic or familial, nor can they be magically repaired when broken or destroyed. 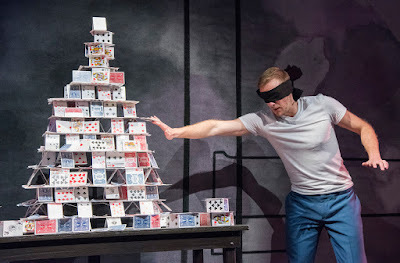 Playwright Andrew Hinderaker, who had previously won a Helen Hayes Award for his superlative play Colossal, which appeared at Olney two years ago, lays out all these cards on the table with his latest work, The Magic Play. There are clear similarities between the two. In each of these unconventional dramas, Mr. Hinderaker blends real-time spectacle with a plot line that includes a gay relationship and father relationship. Additionally, Mr. Hinderaker wrote the role of Mike in Colossal specifically for actor Michael Patrick Thornton, who had suffered a spinal stroke that left him paralyzed from the neck down. The role of The Magician in The Magic Play”was also written for a specific performer; in this case it was for talented actor-magician Brett Schneider. Skillfully directed by Halena Kays, Mr. Schneider, as The Magician in The Magic Play’s three-person cast, performs an assortment of mainly card tricks that produce a number of wow moments for the audience. For most of these, Mr. Schneider meanders through the apprehensive crowd to select “volunteers” to assist in the tricks onstage. Nothing that would cause any embarrassment to the assistant ensues. However, this device makes each performance unique and improvisational. While The Magician is in complete control of his performance in front of an audience and his ability to mesmerize it with astounding trickery, he finds out that the ability to control a relationship does not work, and the deception inherent to magic performances that bleed into his personal life proves to be damaging like a collapsing house of cards. 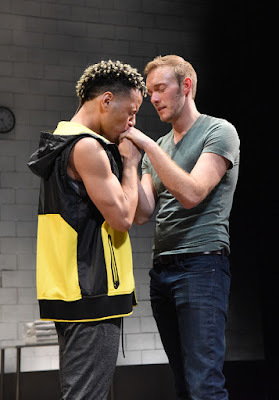 The Magician had undergone a painful break-up with his boyfriend, The Diver, played convincingly by Helen Hayes Award winning, athletic-looking actor Jon Hudson Odom. He is seen practicing his dives from a platform, sans taking the actual plunge, for a shot at the Olympics thanks to a clever set designed by Lizzie Bracken. The interactions with The Diver are manifestations of The Magician’s memories. Though only hints of their relationship transpire during the play, it illustrates how even The Magician’s memories are controlled. Because The Magician is so invested in his work and the deception that is a major component of it, The Diver could simply not trust him, especially when he had lied about visiting his father, played authentically by Olney veteran Harry A. Winter. Father, an over-the-hill magician in his own right living in Reno, had abandoned his son when he was a youngster. He had taught his son the tricks of the trade so to speak, but the younger one blossomed into an accomplished artist. The Magician’s attempt to acquire the paternal love he had lacked provides solid dramatic moments. In an odd twist late in the second act, The Magician asks the audience to reverse the earlier admonition to turn phones off and instead, turn them back on. He urges the patrons to text to a specific number their request for any kind of magic trick they would like to see performed. Another assistant is selected at random. She writes on a card what she would like to see magically happen. The atmosphere turns political as she scribes, “The cheeto must disappear” to an approving but muted crowd reaction. Within minutes, the requested texts are hand-written not only on the playing cards but also projected on the screen. There were similar such requests as well as others like “saw a person in half” and “make the deck disappear” causing this segment to be refreshingly unpredictable theatre. Mr. Schneider is a superbly skillful magician. His showmanship and charming demeanor seduce audience members to believe what he wants them to believe. That’s what magic performances are all about. On top of that, Mr. Schneider is a proficient actor. He exhibits strong chemistry with the other fine actors, Mr. Odom, who had also performed in Colossal, and Mr. Winter, during their dramatic and emotional exchanges. There is no illusion that The Magic Play is pure entertainment. The personal foibles of a magician are usually not observed by the public. This weaving of the showmanship with the human element is carried out competently by an excellent script, a talented director, cast and technical crew. It is highly recommended. Advisory: This play contains profanity and is not recommended for children. The Magic Play runs through May 7 at the Olney Theatre Center, 2001 Olney-Sandy Spring Road, Olney, MD 20832. Tickets may be purchased by calling 301-924-3400 or by visiting online. 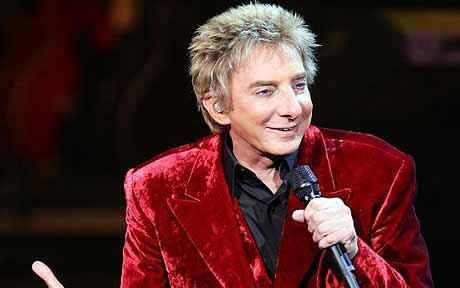 Barry Manilow’s decision late in his life to come out was his alone to make. Social media was bursting with sarcasm when People released an interview with pop singer-songwriter, musician and producer Barry Manilow in which he officially revealed he was gay. “Shocking!” and “I never saw this coming!” were some of the more common jabs. Of course, it wasn’t news that he was gay; it was news that he finally admitted it. The story had broken two years ago that he married his long-time partner and manager Gary Keiff. That revelation merely confirmed that he was gay. For decades people suspected Manilow was gay, and it probably didn’t matter to most of his fans. He launched his career at New York’s Continental Baths as the accompanist for Bette Midler who performed to enthusiastic, mostly gay fans. This took place in 1971, and it would have been rather rare if a straight man entertained in such a venue. Fans didn’t see Manilow through the lens of being straight or gay. They saw an engaging, personable artist, whose Adult Contemporary songs—mostly ballads—were laced with saccharine and the melodies quite hummable. In fact, Manilow had 47 top 40 singles and 12 reached number one. The Latin-style “Copacabana” was arguably the most famous of all his hits. He counted females as a large portion of his fan base and he figured that coming out would hurt him professionally. But through his five decades in the spotlight, Manilow was never considered a heartthrob in the way Elvis or McCartney was during the height of their careers. Moreover, superstar artist Sir Elton John, is similarly not heartthrob material (unless wigs, glitter-laced suits and oversized glasses appeal to many) yet his coming out did little to tamp down his popularity and commercial success. Additionally, open lesbians k.d. lang and Melissa Etheridge have enjoyed lucrative careers as did openly gay Michael Stipe, the front man for R.E.M., who says he’s a better person for coming out. And there are others. Good music, good talent and good artistry seem to transcend sexual orientation because it simply does not and should not matter. Entertainment value is what makes an artist popular, and it seems that those who are disappointed regarding an artist’s sexual orientation would have a negligible impact. Aside from professional risks that Manilow may have considered in deciding not to come out, he simply could have been one of many older gays who still harbor fears about going public. “Manilow was born in 1943. Someone born in that year has witnessed the McCarthy-era Lavender scare, police raids on gay bars, the Stonewall riots, the HIV/AIDS crisis and its accompanying stigma, the strong anti-gay currents of the 1990s, the heyday of anti-LGBT conversion therapy, and much, much more,” writes Samantha Allen in The Daily Beast. But there are risks in coming out: alienation from friends and family members, loss of job, rejection by religious institutions, being bullied, violence, to name a few. Coming out as LGBT is a personal decision that must be taken seriously after extensive evaluation of the risks and rewards. One must reach that comfort level that only he or she experiences before making such a monumental judgment. Barry Manilow thought the time was right. Even now. “What’s the matter with kids today?” That was the question famously posed by Paul Lynde in the classic 60’s musical Bye Bye Birdie. In Iron Crow’s presentation of Edith Can Shoot Things and Hit Them, the question could easily be reversed: what’s the matter with adults? That question is answered in an engaging play written by A. Rey Pamatmat. 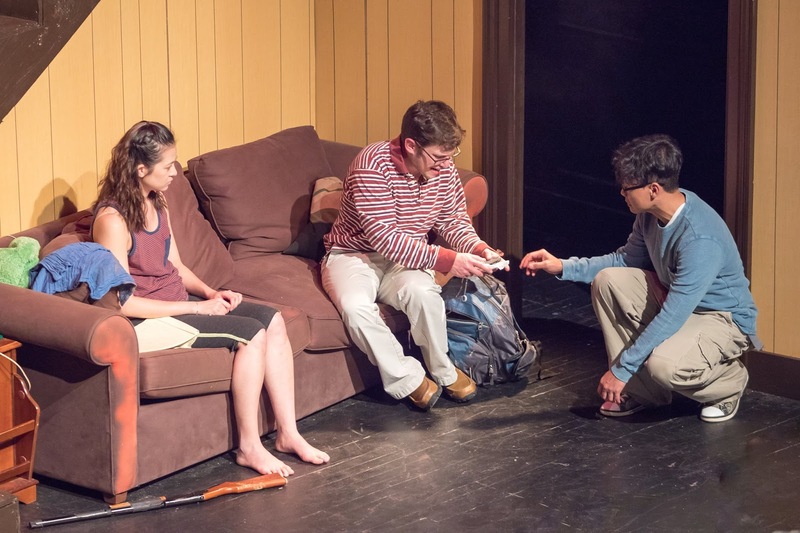 Well directed by Sean Elias and Assistant Directed by Robert Corona, Edith hits the mark thanks to strong acting by the three-person cast who are young adults portraying adolescents. All are making their Iron Crow Theatre debuts. Edith Can Shoot Things and Hit Them tells the story of a 12 year-old girl Edith, played by Pimmie Juntranggur and her 16 year-old brother Kenny (Mohammad R. Suaidi) who are left to virtually fend for themselves in a middle America farmhouse during say, the 1990’s.